Interesting times for Visual Identity. The logo has long represented the heart of a visual identity. But in the last 30 years, some designers have looked beyond this slavish reliance on a single identifying mark. In an age where visual identity encompasses an ever-growing range of media, is it time we rediscovered that sense of adventure? Back in February, D&AD hosted a fascinating little exhibition at their HQ in Shoreditch. 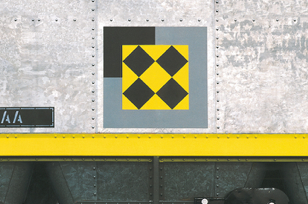 Entitled ‘Design for Rail’, it provided a reminder of the award-winning 1987 visual identity for Railfreight, then the haulage division of British Rail. Created by design shop Roundel, the radical work took heraldry as its inspiration. Each Railfreight depot was given its own diamond plaque design, most of which were adorned with a heraldic creature or device, but realised in a graphic, almost geometric style. Each industry sector Railfreight covered (e.g. coal, petroleum, construction) was also assigned its own graphic, based on a simple square grid and a palette of primary colours. This was head-turning work, not just for its clean, modern aesthetic, but also because it broke the rules. Today, we’ve grown used to the logo’s natural position as primary brand asset, yet this VI relegated the British Rail double arrow logo to a largely supportive role. The prominence of typography was reduced too, leaving the distinctive combination of bold flat graphics, cast metal depot plates and a triple grey colour scheme to carry the brand. Railfreight was reinvigorated. No longer the decrepit, poor man of the rail industry, it now appeared as a modern, efficient and well-organised logistics provider. A side-effect (conscious or not) was that the nationalised provider was now sell-off-ready – a much more attractive target for the private sector companies involved in railway privatisation. Roundel’s Railfreight story shares many parallels with Newell and Sorrell’s controversial ‘World Images’ work for British Airways in the late Nineties. Again, it featured a range of striking ¬¬graphics (this time inspired by the cultural diversity of the BA world). But what captured the public’s imagination was its appearance on the brand’s most valuable real estate – the tail fins of the aircraft. The BA wordmark and ribbon logo were relegated to the fuselage sides. Creating a unified whole from an extremely diverse range of design assets, the work gave a real sense of BA as a global operator, more interested in reaching out to its destinations than its own heritage and national iconography. But it didn’t last long. This was polarising work and, due to some nervousness on the part of the BA board, perhaps, Concorde was assigned a more traditional rendering of the Union Jack. When the business got cold feet, this more traditional – and arguably parochial – branding was applied to the entire fleet. The Railfreight and BA projects differ in many ways. Both were short-lived for different reasons. What they each represent in their own way, however, is a time of confidence, when visual identities could be pushed to the limit – and sometimes beyond. Perhaps the first threat to adventurous forays like this was pragmatic, coming from the globalisation of brand identities. Desperate to rein in the more wayward tendencies of their far-flung foreign operations, brands issued increasingly strict identity guidelines. Creativity was on its way out. Just getting everyone to use the same typeface was seen as a worthwhile aim. With the subsequent rise of the Worldwide Web, visual creativity was forced even further onto the back foot, due to technical considerations unimaginable in the Railfreight era. Ikea famously ditched the Futura typeface in favour of web-safe Verdana, while Waterstone’s dropped that URL-unfriendly apostrophe. On today’s social media platforms, the logo is virtually the only visual component allowed – and even then, it is constrained in a circle or square at the whim of the platform. The ‘look’ is always Facebook, Twitter or Instagram, leaving other aspects of the brand’s CI – copy tone, photographic styling and, perhaps most importantly, behaviour and associations – to carry the brand. Visual identity is disappearing into the background. Perhaps the time has come, therefore, to investigate a more open approach to visual identity, one that suits the demands of modern media and exploits a broad array of brand assets, rather than relying solely on the pillars of logo, type and colour. Perhaps a good place to start is by looking again at Roundel’s work for Railfreight and Newell and Sorrell’s for BA. What is certain is that the breadth of applications over which a visual identity needs to work is more fragmented than ever. In this light, who better to deliver truly innovative solutions than practitioners familiar with the entire modern media landscape?